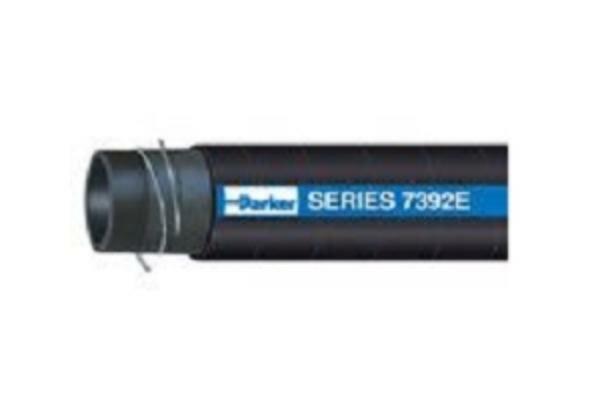 Parker's Series 7392E Standard Duty Water Suction Hose provides economical medium pressure, standard duty service across multiple applications. The lightweight construction provides crush resistance and kink resistance for unimpeded flow, flexibility for easy handling and resistance to abrasion and weathering for maximum performance. • Tube: Black synthetic rubber for versatile service to 180°F. • Reinforcement: Multiple textile plies for strength and durability, and a wire helix for full suction capability and a path to conduct a static charge to ground. • Cover: Black synthetic rubber for resistance to abrasion, cuts, gouging, scuffs and weathering resistance.